Fay Carrie Gayle-Hickle creates quilts in celebration of life and the human spirit. Her quilts are inspired by and/or named for her life experiences. 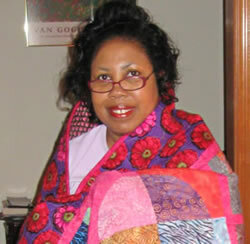 She enjoys using colorful fabrics in the design of her quilts which are contemporary and traditional. She is very thankful for her creative abilities and discipline that enable her to complete many quilt tops each year. I quilt because it makes my heart sing. And while I've enjoyed quilt making for many years, each time I start to make a quilt, it is with the same excitement as if I were making my first quilt. What I enjoy is the creative process that enables me to take a palette of fabrics, with its luxurious colors and designs, and to bring the fabrics together so that they create a quilt whose personality sparkles and stands on its own. And one could not have imagined that these individual fabrics could have worked so well together in harmony. When the quilt is observed, it should speak volumes. Then I know that my work is done. This is my work of art. I came to quilt making by way of working in the Corporate arena for many years and use my quilt making as a form of therapy and relaxation. I am thankful to a kind and gentle soul named Loretta, who first introduced me to quilt making in 1990. I am also thankful that I've discovered something that I can do that brings me tremendous joy. To you I say, find something to do that brings you joy, and do it until your heart sings.